Table Hire London Choices, Choices & More Choices! 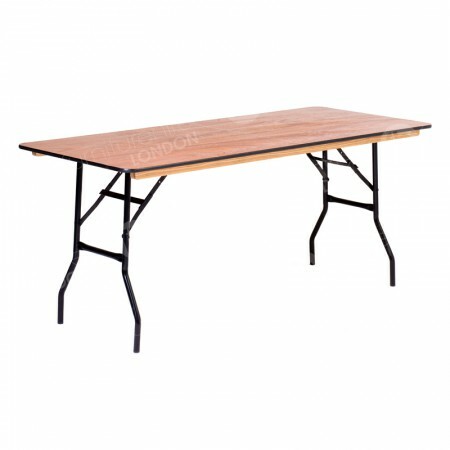 Because we have such a varied range of trestle tables, you might wonder which product is the best for your London event. We’ve made sure to include as much information as possible about every single furniture hire item we stock so you’re able to make the best decision for your function! Tables can serve lots of different purposes, and here’s a little rundown to all the different trestle tables we have, including the differences between sizes and shapes! Whichever table you order, one thing’s for sure, you’ll be getting a top rate product that has many benefits. For a start, being trestle tables, they all fold. Ours are designed to be folded very quickly, a fantastic feature when you want to set them up rapidly. This is of particular benefit when you have a large function scheduled, such as award ceremonies, weddings, corporate balls or formal dinners. In addition to being quick to set up, the folding legs also result in an item that’s easy to stack and store. 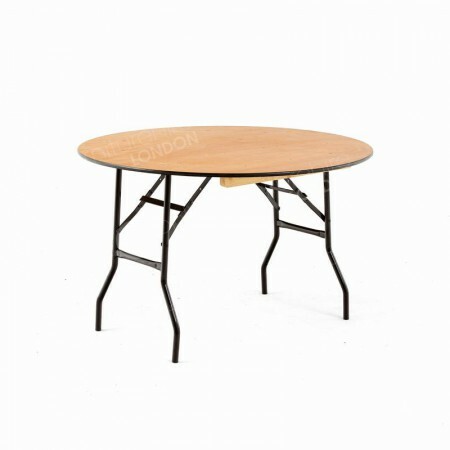 This is very useful when you’ve opted for long term rental and plan to install our table hire range now and again for special events, so require storage for when they’re not in use. Even when you only have them for short term hire, you might also want to take them down and clear rooms before we arrive to collect them, which the folding leg feature allows you to do easily. Other shared features include the fact they are lighter to lift than other models, so you can arrange them with ease in venues - but remember if you want help with set ups then simply book our full installation service and we’ll take care of all of this for you. 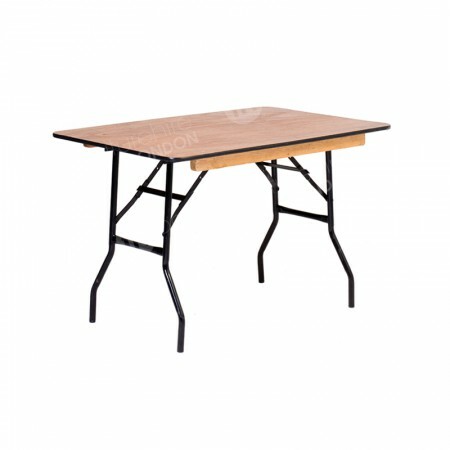 Each of our trestle tables also has an unfinished beech effect top, a perfect canvas to design them as you see fit using our range of black or white tablecloths! 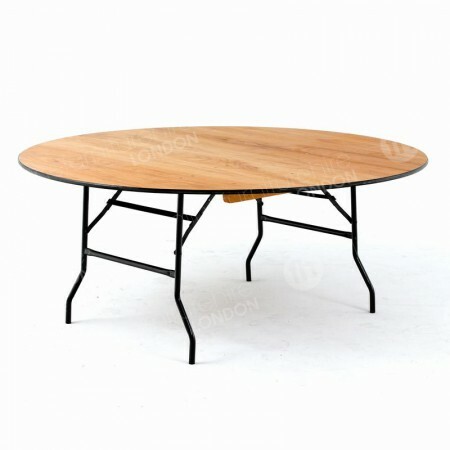 Where our table hire range differs is their shape and size. So, you’re free to order either our circular or rectangular varieties. Of course, we know that it’s also important to offer a varying size when it comes to tables, so whether you’re arranging a huge event for lots of guests, or a more intimate affair, then you can find your perfect table. 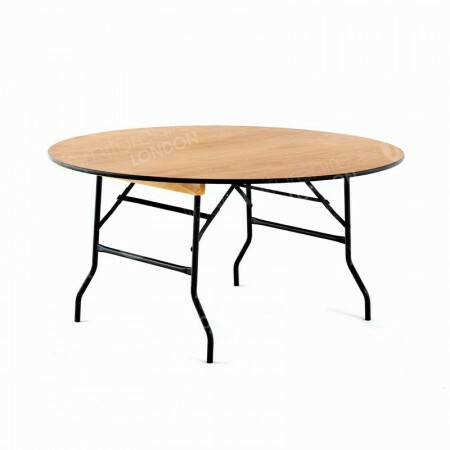 Our circular banquet table comes in three fantastic sizes, 1220mm, 1525mm, and 1830mm, which each seat four, eight and ten people comfortably. Round tables are a fantastic choice for all kinds of formal dinners, such as those scheduled during weddings, award shows, corporate parties and more. The fact that you can dress them with sumptuous tablecloths, napkins and chair covers in black or white, mean you get venues with lots of wow factor. Another option is our rectangular product line, which comes in 1220mm and 1830mm sizes, with lots of room for four and six to be seated respectively.